Leela is an eccentric blend of Hawaiian, Japanese , and American. An Islander at heart, she still believes everyone should be friends and that tropical colors can put anyone in a good mood. Food, design, and learning new things rule her life. You’ll never find her sitting still – she would much rather be out having an adventure than sitting at home. You’ll find almost no limit to the things she’s interested in – don’t get her started on design though, you’ll never hear the end of it! Being that I am from the country in Canada, nature has always been a big part of my life. Honestly, I miss it, the nature that is. I have gotten the chance to experience Japan’s true nature only once. 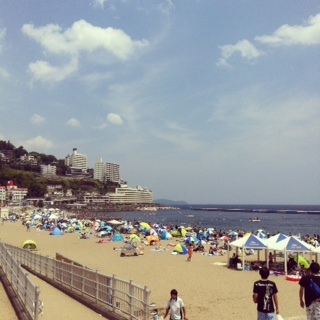 I went to Kyushu in May for a week. It was great, I got to climb a volcano, sleep in a cabin and have my own private hot spring bath. The only things that were missing were a campfire and smores. (If you don’t know, smores are roasted marshmallows with chocolate chips and graham crackers – a popular & tasty camping snack in Canada.) The scenery was so lush and refreshing that I have been wondering why more people don’t get out to enjoy what this beautiful country has to offer, in terms of wilderness. I now spend most of my time in the city. However, when I can, I go to a park to ride my bike or walk around a grove to feel a little piece of the natural world. The only problem is, the parks are usually packed with people, all seemingly trying to do the same thing as I am. Which makes me wonder why more people don’t escape the city entirely for the weekend and spend time in the forest or mountains. Perhaps, facilities are limited, or the prices are too high. It might even seem inconvenient to live without all the services and amenities that one gets used to. However, I have found that overcoming obstacles is a great way to learn about one’s self. Maybe I am just being naive. I don’t know this country well enough to know the real reasons behind what I see. However, in Canada, we have many rural communities dedicated to accepting tourists from distant cities. Tens of thousands of people flood these small villages every weekend, to get away from the hustle and bustle of city life. For all I know, a similar custom could be happening here on this side of the world too, and I would never be able to see it from my balcony. Now that I think about it, it is I who needs to find out what is really out there waiting for me. I should have been doing research on this topic months ago. Perhaps, that is life. Maybe, I get too comfortable with the way things are and I choose not to change them. Do you find that you make judgments without really knowing the truth? What kinds of things would you like to change about the way that you live your life?